Wireless microphone manufacturers have made great strides in producing smaller and more powerful transmitters for their devices that are often body worn. However, this technology can generate uncomfortable heat when positioned next to the body. To solve this issue, K-Tek designed HeatBlock transmitter pouches and handy swatches of the same fabric, HeatBlock Pieces. After extensive research and field-testing, K-Tek devised the new Stingray HeatBlock line. The secret is a patented, heat resistant material that is both soft to the touch, and flexible enough to comfortably be worn against the body. The proprietary three layer material is specifically engineered to withstand a continual temperature of up to 240°C (464F°), well above the range at which the electronics are specified. This advanced material is soft and comfortable to wear against skin yet offers superb insulating characteristics to eliminate the discomfort associated with wearing wireless transmitters. A series of three pouches snugly encase most popular transmitter brands. Fabricated without protrusions or sharp corners, they can be used with or without transmitter clips. What’s more, every pouch and HeatBlock Piece is meticulously hand-sewn at the K-Tek headquarters in California, USA. 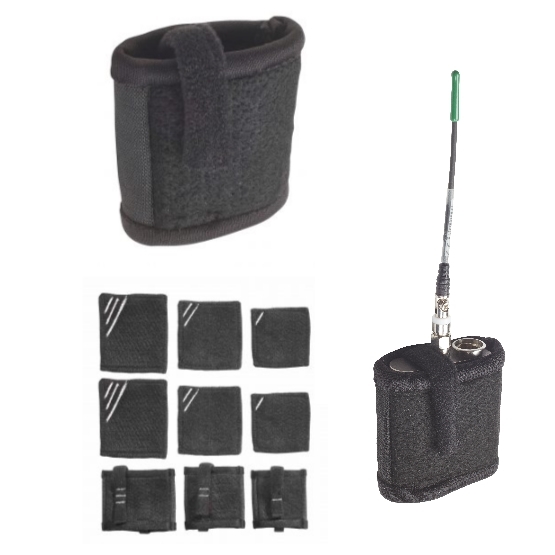 Available in three sizes, there’s a Stingray HeatBlock Pouch to fit most popular microphone transmitters, including the Zax ZMT and the Lectro SSM, SMV and SMQV models. Heatblock Pieces are sized to correspond with the Pouches and come in a set of six with two of each size.